Personally, I love books. My home is full of them. I confess, I got my first chinchilla a bit before the internet existed. So, for a while, I purchsed every chinchilla book I could find (and most of them were published in the 1980's). Recently I've limited my selections to more advanced reading, and that is a very small part of the market. Today you probably don't need to buy an introductory chinchilla book. You can get almost everything you need from the internet, and the information is probably much more current. But, if you are a new or recent chinchilla owner, and you love books... I know you'll have to get some. Just be careful to take everything you read with a grain of salt. Most authors are speaking from their experience, and there is little or no proof for what they claim (as will often be the case with unusual animals). Here are some recommended choices. These are all pretty good choices for new chilnchilla owners, with the Alderton book being more recent and probably the most accurate. For the experienced owner you'll want more detailed information about health, genetics, chinchilla shows and breeding. A good purchase, if a bit controversial (I don't agree with everything in here, but they do offer some experience and good health information) is The Joy of Chinchillas. It's not currently available on Amazon, but you can find it around the web. There are even more advanced books, but they are largely historical, more expensive, and somewhat more difficult to obtain. These are books written by and for chinchilla ranchers, but the combined experience is quite overwhelming. These books are not for the pet owner, but they are useful for an historical perspective. 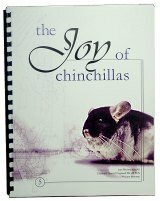 Some of these books include Basic Genetics and History of Mutation Chinchillas and After 40 Years Alice Kline Talks about Chinchillas, both available new (as reprints) from the Mutation Chinchilla Breeders Association.